“Today the Federal Transit Administration announced that they will execute a Full Funding Grant Agreement committing $647 million to the Caltrain Electrification project. Caltrain has worked for over two decades to plan this critical improvement. Over the last few years, more than $1.3 billion was secured from local, regional and State commitments, and contracts were awarded to design, and eventually construct the project. This agreement commits the final funding needed to start construction of a project that will transform and improve the way people travel along one of the region’s most congested corridors. We are very thankful to U.S. Secretary of Transportation Elaine Chao and the Trump Administration for recognizing the value that Caltrain Electrification will create for the Bay Area and the nation by easing congestion in one of the country’s most economically productive regions and creating almost 10,000 American jobs in the process. We would not be able to take this step without the dedicated support from a tireless group of advocates. Caltrain’s Congressional delegation, including Democratic Leader Nancy Pelosi, Congresswoman Anna Eshoo, Congresswoman Jackie Speier, and Senators Dianne Feinstein and Kamala Harris have been unwavering in their support, and can be credited with helping the project endure its most daunting challenges. Our private sector partners led by the San Mateo County Economic Development Association, The Silicon Valley Leadership Group and the Bay Area Council have led the effort to expertly convey how critical this project is to our region’s ability to remain economically competitive. Lastly, Governor Jerry Brown, and California Transportation Secretary Brian Kelly have been instrumental in guiding this project forward every step of the way. The work that they have done on our behalf is testament to their enduring commitment to prioritize investment in the modernization of the State’s transportation systems. Caltrain has been planning for the electrification project since the 1990s and the PCEP has received broad support from the business community, labor and environmental groups, regional transportation advocacy groups, local, state, and federal elected officials. to a contractor to build and deliver high-performance electric commuter rail trains. A Limited Notice to Proceed (LNTP) has been issued to those contractors to advance design of the project. A Full Notice to Proceed (NTP) must be issued in order to maintain the terms of the contracts and avoid costly penalties and project delays. Caltrain has secured all local, regional, state, and Federal non-Core Capacity funds for the project. The only funding that is needed is $647m from the Federal Transit Administration (FTA) Core Capacity program. Over the last two years, Caltrain and the other PCEP funding partners have worked with FTA to meet all of the Core Capacity FFGA requirements to secure the $647m grant. 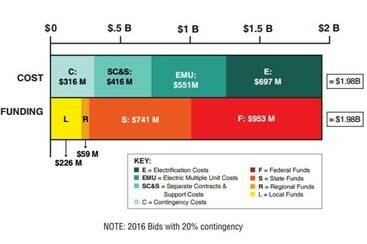 The project has already received $73m in previous appropriated Core Capacity funds and the FFGA allows Caltrain to access those funds in addition to future Core Capacity funds.